Arbitration Experience: Has represented parties involved in international and Greek arbitrations. Has acted as an arbitrator in international arbitrations, mainly before the ICC. Education: Degree in Law, University of Athens, DES in Public Law, University of Paris, PhD, University of Thessaloniki. 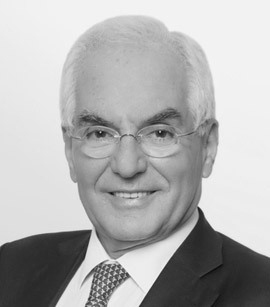 Professional Career: Panayotis Bernitsas has been Managing Partner of Bernitsas Law since 1984. His active, broad-based commercial practice incorporates 35 years of experience, in transactional, advisory arbitration and litigation work. Panayotis is an authority in EU, competition and antitrust law and has represented clients in prominent cartel cases before the Hellenic Competition Commission. He is a senior litigator, with vast experience in all types of dispute resolution, and represents clients in complex, high stake civil and administrative actions before the high courts and arbitration boards. Panayotis is also an expert in concession projects and privatisations, with a track record of playing a key role in many of the pioneering, ground breaking transactions to have taken place in Greece. His real estate practice is focused on large scale developments and real property asset portfolio investments. Panayotis was an Associate Professor of E.U. Law and International Business Law at the University of Thrace between 1983 and 2007 and has acted as advisor to the Prime Minister on E.U. matters between 1989 and 1990.